ENDRE - Book #2 in the Internationally Bestselling YA Fantasy Series, The Elsker Saga. Featured in USA Today! Winning the heart of an immortal assassin was a dream come true for Kristia Tostenson. But her decision to become immortal could end in heartbreak--not only for Kristia, but also for the god who loves her. While Ull would do anything to protect his bride, even the God of Winter is powerless against the Norse apocalypse. Ragnarok is coming. And the gods aren't even close to ready. read it quickly to get to the next great book! The second in the Elsker series seems to be more of a transition than a story in itself. In Endre we follow Kristia as she acclimates her life with Ull, and all that being with a Norse god entails. Like the first, it is well-written with interesting characters and a beautiful new insight to Norse mythology. This book mainly focuses on the interactions between the couple--and those who try to hinder their being together--and their feelings for each other, with a few minor side-stories thrown in regarding Kristia's visions and her impending role as The Seer. But these seem to be more set-up and anticipation-building than action in their purpose here. That said, it's a quick read and I am looking forward to seeing what happens next with all these kinks in Ull and Kristia's future together. S.T. Bende does it again with this amazing story! Ull Myhr has stolen my heart and I am so happy with the way the story was written and all the lovely details that made it come to life for me. Kristia remained strong throughout the story and I loved that! She steps up in a time of need for mostly strangers for the man she loves. I hope to see more from this interesting family and the fabulous author! Huge fan of Norse mythology! Love the Romance and the story line. Author is a great writer and has a really good imagination. I have read this series before and will most likely do so again. 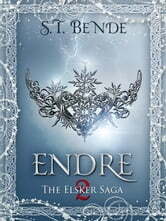 Wow, the second book of the Elsker Saga, “Endre” by S.T. Bende is amazing. I love reading how much Kristia is developing her visions and how much stronger she is becoming. She is starting to adapt to Ull’s world and is amazingly strong and brave while doing so. Her visions with the Elfie guy are getting more dangerous and terrifying. Every time she has one I’m biting my nails on what is going to happen. I love the growth of Ull’s and Kristia’s relationship and how Ull’s starting to be a little less overprotective. It’s sweet on how much he does want to protect Kristia but at the same time beginning to trust in her to hold her own. Gunnar of course is “funner” as usual. I love how much closer Kristia has become with Inga and Olaug. These lovely supporting ladies are such a joy to read. The wedding is magical and romantic. Endre has wonderful relationships and more character building on not just the main characters, Ull and Kristia, but of their supporting characters too. Definitely a wonderful continuation of the Elsker Saga. S.t. Bende delivers another cracker of a book!! It takes a strong woman of courage to love a beautifully delicious Norse God, and tho the course of true love never did run smoothly, Kristia Tostenson is going all out to prove she is the woman for the job in this fabulous second installment of S.T. Bende's Elsker Saga. Picking up straight after Elsker, we find Kristia's life has become a whirlwind of planning her wedding to her hero while at the same time finishing up her University year, learning the ropes to becoming the Goddess of Winter and trying to find a way to thwart the end of the world at Ragnarok. On top of all that, she also has to deal with ongoing threats of harm from a nasty Elf-Man who constantly haunts her dreams. Luckily, she has help from her pretty fantastic friends Inga and Gunnar ( ahhh Gunnar :) ), her roommates Victoria and Emma, Ull's Grandmother Olaug and her unbelievably romantic fiancé, who go out of their way to keep her grounded, happy and above all else, safe. I don't want to say too much more as I don't want to spoil anything... suffice to say S.T. Bende's descriptive talents really are second to none - giving the reader a rollercoaster ride from laughing out loud to "oh no!!!" to wiping away a little tear of joy by the end of the book... Her characters are so well rounded that you can almost imagine them walking straight off the page and sitting in your living room with you...The whole series is a joy to read over and over again. You'll laugh, you'll sigh, you may even cry, but you won't regret reading it.